The Christmas light are being taken down and the ornaments tucked away, the purging of closets and toy chests is in full force, pencils and keyboards are working away at those goal lists, and marked-up 2018 calendars are making way for fresh new ones with 2019 filling the date space. My personality loves the new year; the fresh, the clean, the anticipation of what’s going to fill our days, the hope for new adventures and memories and deeper growth. I love tucking away the moments and memories from the past year to be cherished or learned from in those mental keepsake boxes we all have, and pulling out a new one just waiting to be filled. This past year was a beautiful one for our little band of four, an ebenezer year for us I think. Starting the year having just welcomed Jack into our world was truly remarkable and there are so many reasons why I cherish the way the Lord orchestrated the timing of Jack the way He did. This year, I turned 30 and I couldn’t have been more excited. 29, though it held one of the most treasured parts of my life, was a rather difficult year for me, and I was ready to meet 30. 30 has been one of the best years I’ve lived. This year, Jas started his MBA program, has done remarkably well in it, and balanced a full-time job, school, and a side-job many weeks of the year, all the while not skipping a beat as husband and daddy. I couldn’t be more proud of him or grateful to live this life alongside him. This year, AK turned 7, started 1st grade, and became a little woman. Her creativity is endless and her thoughts so deep, and watching her with Jack is magical. This year, we traveled to see family and friends, and were reminded again that the people we are surrounded by, near and far, are such a means of grace in our lives. This year, we had our second “just us” vacation and it was perfect and again, just what we needed. This year, we learned more about how to live simply, to have margin, to discern and guard what the four of us need, to say “no” when it’s the wisest thing for us to do, to enjoy one another’s presence even more, to make the most of everyday, to fight comparison and practice gratitude, to put screens away and pull out books and game, to communicate better, to put one another first, to serve with joy, to take more walks and be outside, to dream more, to pursue creativity, to encourage, to challenge, to speak truth, to love well, to pursue relationships, to think well and wisely, to listen, to be patient, to make beauty with what we have, to be gracious and kind, to make messes, to try new things and celebrate small victories, to play more music, to light more candles, to have more dance parties, to stay within budget, to rejoice with others and weep with them too, to be hopeful and excited, to be honest in our struggles, to be joyful in our struggles, to be flexible, to let go, to ask forgiveness, to sacrifice and to save, to be together, to cherish these days, to make Jesus known, to trust Him more. In so many ways, it’s been a simple year, and that is what we have loved. The heart work that’s behind that simplicity, though, has been profound and something, we see, that the Lord has been prodding us toward for many years now. To see that fruit come and to begin to enjoy it, even in those pruning moments, has been a thread of grace running through the 365 days of 2018. It’s a strong one, that thread, one of those that’s holds the work taut. I love how the Lord knows which threads to weave when. I’ve loved this year He wrote for us. I’m ready for the next one, too. 2017. A new year has come again. I'm thankful that this happens every year. I'm thankful that we get to tuck away another year, full of its own moments and seasons of hard and good, add it to the memories of all the years that have come before it, and crack open the binding of our newest addition. I'm thankful for the way that it makes me pause and consider, taking a bit of extra time to reflect on what has just passed and what lies ahead. I'm thankful for the planning it inspires, the old dreams that still remain and the new dreams that just begin to take root, and the hope that it refreshes in my heart. I'm thankful for the conversations that we have about what we've walked through and what we are facing. I'm thankful that it is new. 2016 was a hard year for me. It rubbed me raw. This past year was one marked by waiting, craving the answer to unfulfilled longings and finding the answer still to be, "not right now." It was a year marked by fear, fear springing from not knowing truly what my little one was battling and of being terrified that I wouldn't be able to help her. 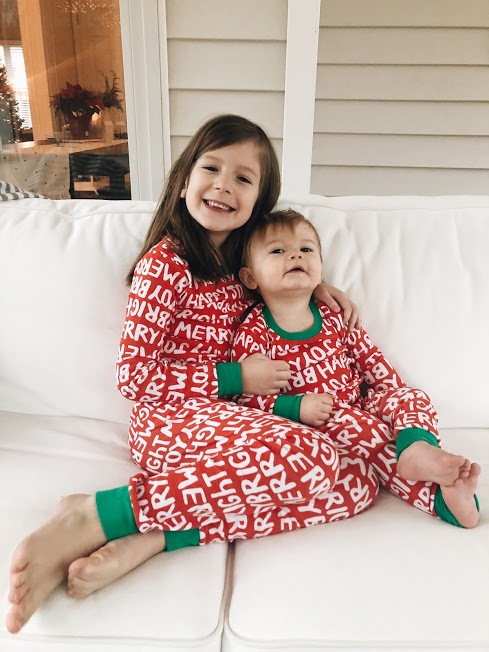 It was a year marked by exhaustion, exhaustion in figuring out how to be mama to my little, in staying on top of all that life held, in feeling like I was behind and forgetful with so much. It was a year marked by plummeting to the depths of certain sins in my life, feeling slapped across the face with how toxic and present they were and then embarrassed at how little I actually wanted to fight some of them. It was a year that felt like I was being pruned until I had nothing left. And yet, here I found the "new." Here, in this place of looking back over the past 365 days of pruning and utter rawness, sits the start of being made new. I am face to face, again, with how desperately I need Jesus. He removes that fear; goodness, He utterly shatters that fear. He meets me in that place of unfulfilled longing and reminds me that He doesn't withhold one good thing from me when I walk with Him. He lets me fall on my exhausted face once again so He can gently pick me up and remind me that His grace is sufficient, His power is perfect in my weakness. And He gives me the greatest hope, time and time again, that those sins that seem so overbearing, so consuming, aren't the truest thing about me anymore. He's making me new. I am so grateful that the little word that graces the middle spot of that catchy "Happy New Year!" phrase we all shout at midnight every December 31st holds a heavy amount of meaning, really wonderful life-changing meaning. And I am grateful for 2016. It was hard year, but it was threaded through with a lot of grace. That grace was found in the adventures experienced, the books read, the travels had, the food cooked, the holidays celebrated, the new opportunities given; but that grace was most especially found in the people that fill up my text message app and my everyday, the people who walk through the raw and the lovely with me, who do more and say more than I could ever write down, and who show me Jesus in every piece of it. In particular, the 2 souls that I've been given to love in the most tender way, the ones who are tangible pictures of the kindness of my Lord every hour of the day. This life of mine. It's full of beauty. It's full of beauty because of the one common thread that has weaved through my words here: the One who makes it all new. 2017, I'm glad to see you. Hello, friends. Happy Monday to you. And this is not just any Monday. This is the first after Thanksgiving, truly Christmas season, twinkly lit Monday. Ooooooo, I'm giddy. Giddy that it's Christmas season. This year has extra sweetness woven through it for me but I shall share more about that later. Right now let's talk about Thanksgiving. Did you all have a delicious Thanksgiving Day? I do hope so. I hope you watched those big balloons float down toward Macy's and ate that extra piece of pie and had those laughs around the table and played those card games. I hope that you made that list of what you were thankful for and that you aren't going to let it fall to the wayside now but, instead, let it weave a thicker thread of thankfulness into your everyday. I felt that the Lord deeply impressed that on my heart this year. This Thanksgiving Day is beautifully set apart to ponder and share and remember what we are thankful for but it really ought to be an example of what we are seeking, often fighting, to do every single day -- to "give thanks in all circumstances." That phrase has been whirling around much in my mind this past week and I'm praying that the Lord will help me put feet to it even more. I always have something to be thankful for, even in the hardest of the hard. I always have something to be thankful for because I have Him. This year we took our time. We woke up slowly. We went for a nice long walk, pausing to notice those last remaining gold and orange leaves and talk about the birds nest J discovered in a tree. We popped a can of pillsbury orange rolls and made eggs with tomatoes and feta cheese and watched the Macy's thanksgiving day parade as we sipped our coffee and orange juice. We made the feast, some things were from scratch because once you've tried Pioneer Woman's mashed potatoes you can't have them any other way, and some things were pre-made because it was just simpler that way. We face-timed with our families and relished the fact that we could share stories and laughs with them hundreds of miles apart. We sat down to our decorated table with our plates piled high and gave all the appropriate groans of "I'm so full" by the end. We filled tupperware with leftovers and celebrated all over again the gift of having a dishwasher. We talked of what we were thankful for, we put on comfies and J built us a fire. AK went to bed supremely happy having finished off a s'more and filled with the knowledge that the Christmas tree would be going up the next day. We ate chocolate pecan pie, drank decaf and watched an episode of our current favorite tv show. And then the day came to an end, with several comments of how sweet and good and perfect a day it really truly was. It was the Thanksgiving Day we truly hoped it would be. Our hearts did ache missing the company of those precious people we get to call family, but we knew this was what we needed. The Lord gifted us these days to refresh our weary hearts. The past 4.5 days have been a nourishing balm for our little band, filled with all our favorite things that we enjoyed just the three of us....and Winnie too, of course. It was needed. It was prayers answered. The Lord's timing, you guys. I just can't get over it.